Strawberries are coming in season, one of my favorite food times of the year. Here in northern Virginia we have to wait a few more weeks, but warmer areas of the country are already basking in the glow of the beautiful fresh red fruits. 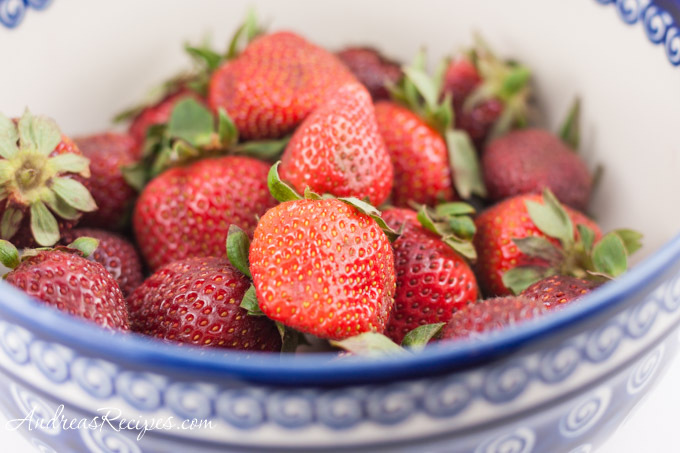 My boys are always excited when we come home with strawberries, and they eagerly watch and try to sneak a few nibbles as I wash and trim the fresh berries for salads, ice cream, granita, pies, tarts, or just eating out of hand. 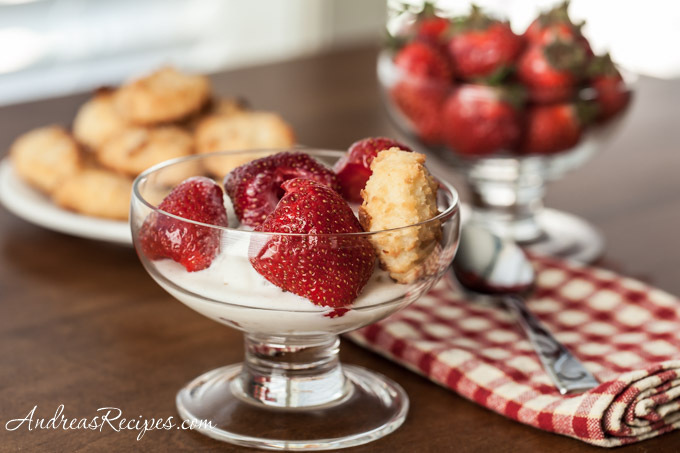 This recipe for strawberries and cream comes from The Military Wives Cookbook, by Carolyn Quick Tillery. 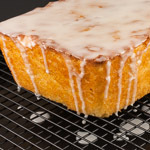 It’s an easy dessert that’s elegant enough to serve to guests. We loved the flavor and think the macaroons lend even more taste and texture. I’ve modified things a bit from the original to suite my taste, reducing the sugar, drizzling some of the Cointreau mixture over the berries, then pouring some of the ice cream mixture on top in the serving dish rather than tossing them all together. I like to see the redness of the berries when I eat them and thought they would look pretty displayed that way. 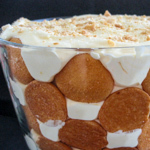 The recipe makes a substantial amount, and though it says 2 servings, I would spread it out over 4 pretty dishes for a light dessert. To serve this dessert to children, just use fresh strawberries with the cream mixture and cookies (no Cointreau for the kids). You can make your own macaroons or purchase them from your favorite bakeshop or grocery store. Pat the clean strawberries dry and place in the mixing bowl. Sprinkle sugar and Cointreau over the strawberries. Toss lightly, then refrigerate for 1 hour, stirring occasionally. In the bowl of the stand mixer, beat the heavy cream until stiff peaks form. Fold in the vanilla and almond extracts. SERVE: Divide the macaroon crumbs between the serving dishes, then place strawberries on top of each pile of crumbs. Drizzle some of the Cointreau mixture over the berries. Fold the softened ice cream and heavy cream together, then spoon some of the ice cream mixtures on top. Garnish with a cookie and serve immediately. Do you ever do strawberry you-pick? If so, any recommendations for those of us also in Northern VA? You can find more at PickYourOwn.org. We are just starting to get California strawberries in the markets here. I hate to say it, but I like them better than our FL ones. Love what you did with them here. 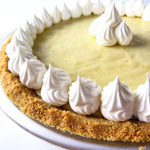 This is a perfect, light and elegant dessert, with or without the Cointreau! Strawberries and cream plus cointreau and macaroons. What a great way to dress up strawberries and it sounds delicious! I cant wait to go berry-picking. strawberries are in season but some of the farms have advised me to come a bit later. preferably in june. same with blue and blackkberries. Delish Andrea. We , sadly, are past our strawberry season here. We are still getting gorgeous raspberries, but I have been spoilt, being able to pick them at home, now I can barely bring myself to pay the exorbitant price for them in the shops. Are you growing your own? African Vanielje: We planted a some strawberries last year that didn’t do so well, so we build up the ground and replanted this spring in hopes of a good harvest next year. We’re really looking forward to those strawberries, as long as the rabbits and birds don’t eat them. I think we’ll have to cage them somehow.